Written for the Coursera (MOOC) Class ‘Energy, the Environment and Our Future’ by Pennsylvania State University (Jan 2014). The United Kingdom has been extracting oil commercially from oil shale since 1851. However, large scale extraction began more recently with discovery of the Montrose field in the North Sea in 1969. In 2011, 1.043 million barrels per day of crude oil (51,972 thousand tonnes per year) was produced . According to the UK government statistics, Department of Energy and Climate Change, approximately two-thirds of UK crude used was produced in the UK. 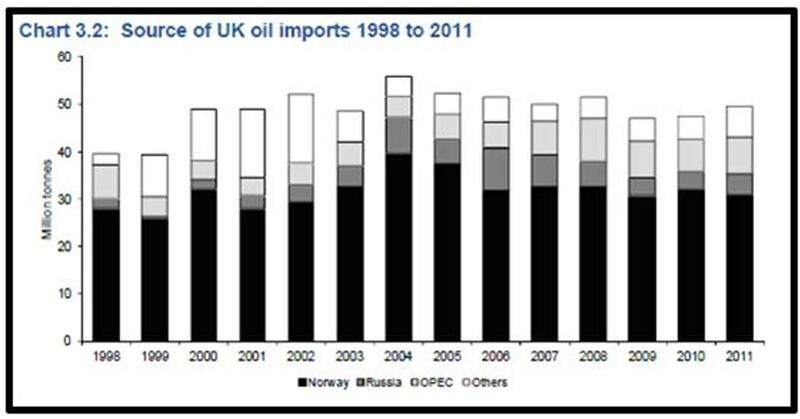 The vast majority of imported crude oil came from our North Sea neighbour, Norway. This is illustrated in the DECC chart below. Historically, the UK was a heavy importer of crude at the onset of major domestic production in 1970. 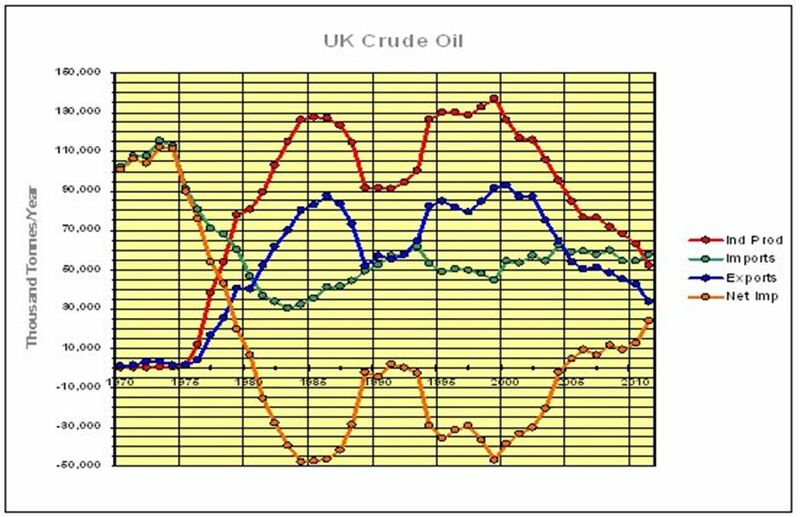 By the early 80’s, the UK was a net exporter of crude oil and remained so until 2005. Indigenous production has declined steadily since 2000. These trends are illustrated in Figure 1, below. Refined petroleum products, are processed at one of the seven remaining refineries in the UK. There were 18 refineries in operation in the late 70’s, but largely due to competition from refineries in the Middle East and Asia, many have closed down, two closed between 2009 and 2012 . 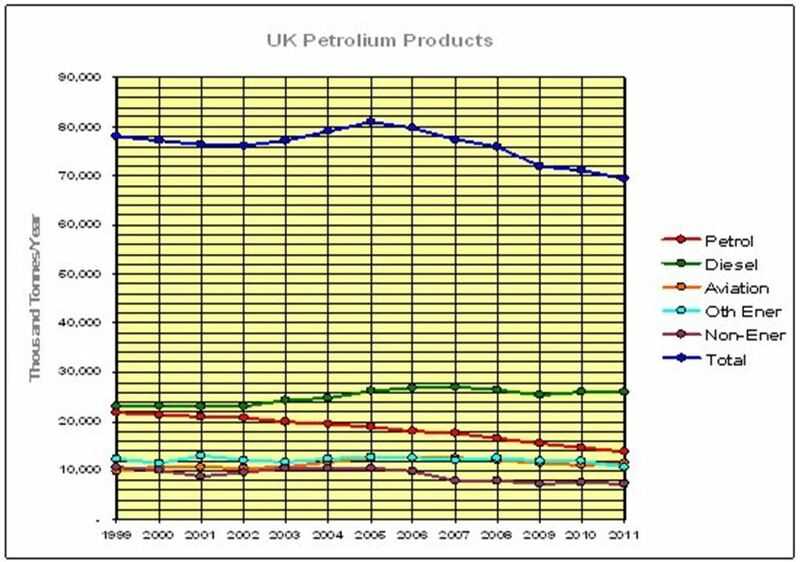 In 2011, almost 70 million tonnes (1.4 million barrels per day) of petroleum products were used in the UK. The breakdown of products is listed in Table 2, below. Transportation fuels constitute the bulk of liquid fuels used. 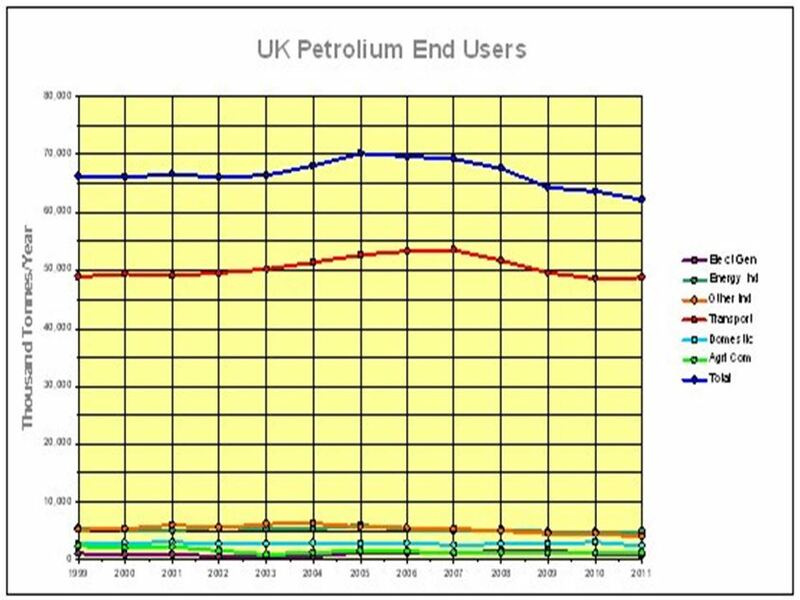 The historical trends for UK Petroleum Usage between 1999 and 2011, is shown graphically in Figure 2 below. The recent overall trend is downward. There has been a constant reduction in petrol (gasoline) consumption for the past decade, with all other uses including diesel and aviation stable for the past 5 years. When we examine the end user data, there is one super-user in the group, see Table 3 below. Transportation accounted for nearly 80 percent of petroleum usage in 2011. All other industry and commercial use, including agriculture was 16 percent and domestic non-transportation use accounted for almost 4 percent. Historically this is true also. Figure 3 below, plots the numbers from 1999 to 2011. Transportation fuel gas been the far greatest demand on petroleum in the UK for decades. All other uses have remained fairly constant. Digest of UK Energy Statistics, UK Gov.